In July 2016, La Hoya Lorca Club de Fútbol changed its name to Lorca Fútbol Club when it was bought by former Chinese international player and manager Xu Genbao. And just one month earlier, FC Jumilla was taken over by Chinese famous football commentators Li Xiang and Tang Hui together with Argentinian partner Rubén Iglesias. In fact, because Li, Tang and Xu are all from Shanghia, when Lorca played FC Jumilla in November 2016 the match was broadcast live over the internet in China to 300 million people and was dubbed 'the Shanghai Derby'. But don't think China are here to improve Spanish football. Xu has 24 of his youngsters from his Shanghai academy training with Lorca. And they're in La Liga too - a Chinese model car maker, the Rastar Group, whose chairman is billionaire Chen Yasheng, took over Spanish La Liga club Espanyol in January 2016, taking 54 percent for 50 million euros. Not to mention their long association of "buying" club spots for players - as way back as 2003 Xerez signed Shang Yi from Beijing Guoan. Xerez received 60,000 euros to guarantee the Chinese international Shang Yi, which was put up by a "personal sponsor" of the midfielder. The same person also paid for a Chinese translator to travel with Shang Yi, who upon his arrival at the club shouted "Up with Xerez!". He would play eight games, clocking just 157 minutes, and scored one goal - albeit against Cádiz, fierce rivals of the club, for which he is mainly remembered. Not to mention that after the acquisition of 20% of Atlético de Madrid by Wanda, in the summer of 2015, the team toured China playing against local teams, lining up Xin Xu. The player played two games in the Segunda B, a grand total of 98 minutes, before heading back to Chinese side Guangzhou Evergrande. In that same summer, after Rayo toured China, as part of their sponsorship deal with Qbao, Zhang Chengdong was imposed on Rayo Vallecano by their shirt sponsor Qbao. Paco Jémez was furious, saying that the signing "suits me like a hole in the head". A furious battle ensued - Felipe Miñambres, the sporting director, saying that Paco "had known for a long time that such a signing was likely", that it hadn't happened for two years and that Felipe had asked for the player and the sponsors delivered on his request - and if they hadn't then another year would go by without having a Chinese player. Paco later said he never denied that he was aware about the circumstances, called Zhang "one more player" and commended his performances in training - while at the same time noting that Zhang plays "a little in a position where we have a lot of players." And all of that - for what? For nine minutes, history was made. 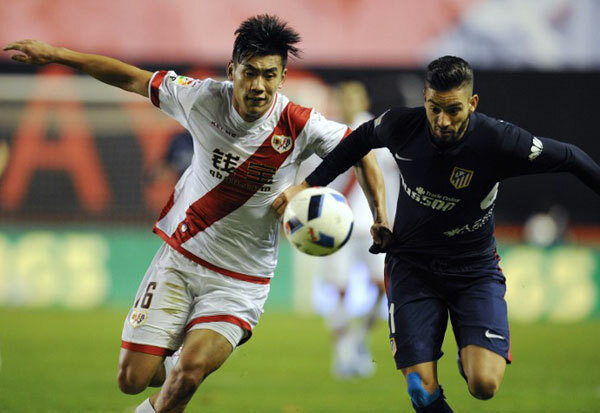 Zhang Chengdong, aka Dudú, made his La Liga debut against Atlético Madrid, coming on for Dorado. He became the first ever Chinese footballer in La Liga. A La Liga career spanning nine minutes was the result of a Chinese sponsor and a player who was spotted by a Rayo sporting director who saw said player play in Portugal for three seasons. But more importantly, it sparked a bitter feud that exposed both superficial problems at the club on a sporting level, as well as systemic problems in how the club was being run and where it was getting its money from.